When it comes to habitat loss, most of us are familiar with deforestation, especially the loss of tropical rainforests. Yet another disappearing habitat — one that gets less press — is in our own backyard. Tallgrass prairies once covered some 170 million acres of North America. Their decline began in the mid-1800s when European settlers began converting them to cropland. Today less than 1 percent of original prairies remain. This disappearing ecosystem is a concern on several counts for prairies provide a wide range of ecological services. Because prairies typically contain a large amount of wildflowers, they draw an enormous amount of insects. These insects are the protein base (like plankton in the ocean) for local food chains, providing food sources for other insects and wildlife. Below ground their extensive root systems, which can grow as deep as 15 feet, prevent erosion during dry times and slow runoff during wet times. Indeed, 1 acre of prairie can absorb up to 9 inches of water per hour before runoff begins. Prairies also improve water filtration, deliver more oxygen to soil (increasing organic matter), help control invasive weeds and store large amounts of carbon. The Edward Lowe Foundation has been planting tallgrass prairies since 2000. 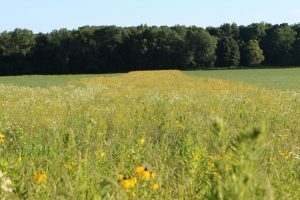 We started with a small field on the northeast side of Big Rock Valley (BRV), our 2,000-acre home in southwest Michigan, and today we have 183 acres of prairie in various locations. Getting a prairie stand fully established takes about three years. Typically, we plant a soybean crop first to help get rid of weeds. The following spring, the unit is treated with herbicides to further clean the seed bed, and then we sow prairie seeds. You don’t usually see blooms the first year because the seedlings are busy establishing their root systems. Once the plants begin growing above ground, periodic mowing is important for weed control and to enable more sunlight to reach ground soil and emerging prairie plants. As the prairie stands become more mature, prescription burns become an important management tool to discourage woody vegetation (trees and shrubs), control invasive species and return nutrients back to the soil. In addition to more effective management processes, we’ve also become more strategic about the location of our prairie units at BRV. Initially we started them in old hayfields that had turned to grass. Then we began establishing prairies strips next to woodland areas to create corridors that animals could use to travel safely to different habitats. One of our prairie strips is adjacent to a large valley and helps protect our Sharkey Lake basin by slowing down erosion. Sam Stefaniak and Jenna Walters paint fluorescent powder on gray-headed coneflowers. About four years ago we began planting strips of tallgrass prairie in some of our agriculture fields — an experiment in soil restoration. Currently we have four strips, and each measures 80 feet wide and averages more than a half mile in length. They run parallel with about 440 feet of cropland in between. The plan is to plow up these strips every 7 to 10 years and plant a new prairie strip in an adjacent section. 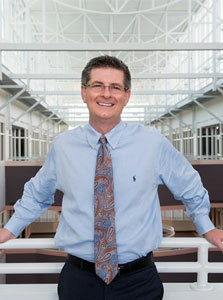 Over the years, BRV’s prairie units have been used by academic researchers from a variety of universities. 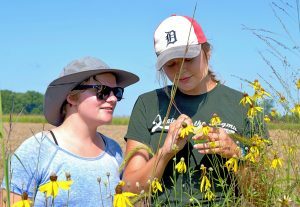 In one study that started this summer, Jenna Walters, an undergraduate student at Michigan State University, has been investigating pollen movement in prairies, which may have an impact on genetic diversity. This intriguing project involves painting fluorescent powder on prairie flowers in the morning and then tracking the movement of pollen at night using black lights. Results from the study should help expand our knowledge of how prairie ecologies work — and help land managers understand how much they can rely on natural pollination to maintain genetic diversity before investing in expensive seed mixes. BRV’s prairie units now represent almost 10 percent of our property, and we continue to expand this habitat, adding 4 to 8 acres each spring. We believe that prairie restoration is an important adaptation management strategy, especially in the light of global climate change. With their significant conservation services — from improving water and soil quality to serving as foundational building blocks for local food chains — prairies can help stabilize loss of species and enhance biodiversity. Bottom line, just as they played a critical role in our conservation history, prairies need to be part of our future.